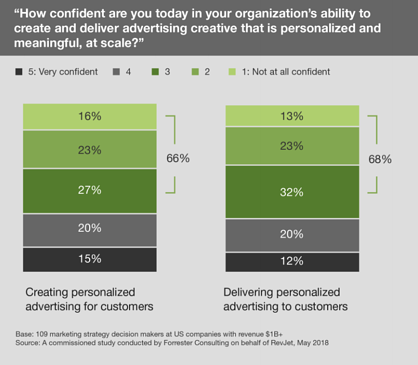 It’s a safe assumption that enterprise marketers at companies with at least $1 billion in annual revenue have confidence in their ability to create and deliver personalized advertising, right? Not according to "The Personalized Advertising Confidence Gap,” an October 2018 study commissioned by Forrester Consulting on behalf of RevJet. The study was the first to evaluate marketer readiness and capacity to deliver advertising creative that is personalized, meaningful, and at scale. To create it, Forrester surveyed 109 decision-makers at companies with at least $1 billion in annual revenue, who are involved in their company’s marketing strategy. In this era of customer-obsessed marketing, modern marketers at Fortune 500 companies know that they must deliver relevancy and value in their digital advertising, and there is nearly a quarter trillion dollars of digital ad spend at stake in 2019. Not only that, but enterprise brands know they have to quickly engage their audience – within five seconds for video ads. However, nearly 70 percent of enterprise marketers lack confidence in their ability to create and deliver personalized advertising. Consumers now expect, both consciously and subconsciously, to be engaged by advertisers through messages that are relevant to their personal challenges and desires. For marketers, this means that a one size fits all creative strategy is no longer viable. In order to effectively, and efficiently, speak to consumers in this age of unreasonable expectations and high stakes, marketers need to deploy advanced capabilities. This is an issue though, as the study found that those firms who want AI capabilities for their marketing campaigns were 65 percent more likely to say that they lack the needed the technology than to say they lack the necessary skills. Additionally, a shockingly low four percent of respondents reported having all of the digital advertising capabilities they wanted. 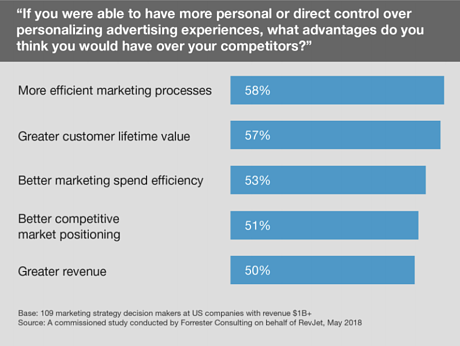 The survey displays an interesting confidence gap: marketers know that they need to create relevant and personalized ad experiences, and they have the skills to do so, but their companies aren’t providing them with the technology to successfully carry out their responsibilities. This confidence gap is an issue across all industries. 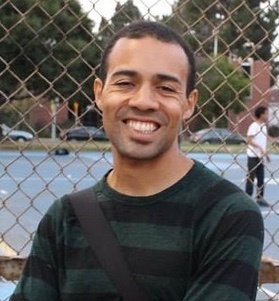 We’ve written extensively about related challenges in this two-part blog series last year. It’s all about getting the right ad in front of the right person at the right moment– in other words, delivering advertising that is personalized and meaningful at each stage of the buyer journey. Popular creative technology allows you to serve an ad for snow tires to a consumer in Boston worried about an impending storm, while at the same time displaying performance tires to an amateur racer in LA, but it can’t tell you the best ad concept or the best way to present your product. However, this confidence gap expands beyond DCO, as there are multiple advanced capabilities that modern marketers desire. The study commissioned by Forrester found that artificial intelligence, real-time personalization, and identity resolution are the three new technologies marketers hope to gain. In today’s world, companies must be obsessed with delivering relevancy and value in their advertising in order to stay ahead of the competition. 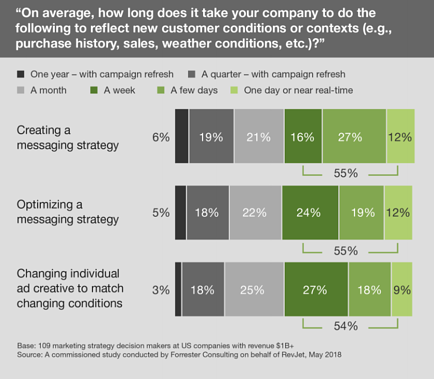 This study also showed that companies struggle to respond to the constant change of customers’ context because more than half surveyed require at least a month to create or optimize a messaging strategy. “Forrester's research shows that for Fortune 500 companies to stay ahead of the competition and quickly respond to customers' constantly shifting needs, they must embrace modern technology that delivers personalized, meaningful ad experiences," said Mitchell Weisman, RevJet founder and CEO. "This aligns perfectly with RevJet's mission to provide a comprehensive enterprise platform for entire marketing teams to deliver relevant, effective and timely advertising experiences seamlessly, at scale."